One of the challenges of being a new author is self-promotion. In the six months since Music at the End of Life was published, I have sent letters, emails, and review copies of the book to as many people as I can think of. Some of these efforts have led to great responses from colleagues and loved ones, as well as Connecticut College and The Jefferson Exchange in Ashland, Oregon. Other letters and emails have gone unanswered. A few months back, I sent a copy of the book and a letter to Harvard Magazine, the alumni magazine for Harvard University. Their website gives extremely clear instructions about how to submit books for review. These instructions include a gentle reminder that they receive a high volume of requests, and the “Off the Shelf” column includes only a very small number of the books submitted. Several months went by since I submitted my book. When each issue arrived, I carefully read the “Off the Shelf” column, trying to determine whether or not my book would fit in with those listed. Then last week, the November December 2010 issue arrived, and my book was included! Needless to say, I did a big dance around my kitchen. 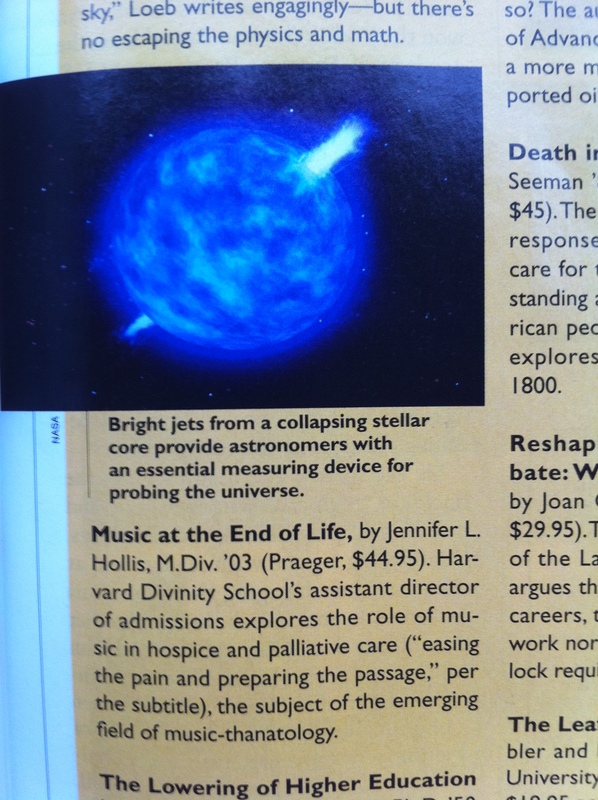 I can’t be certain, but I would bet that this is the first time that “music-thanatology” has appeared on the pages of Harvard Magazine. 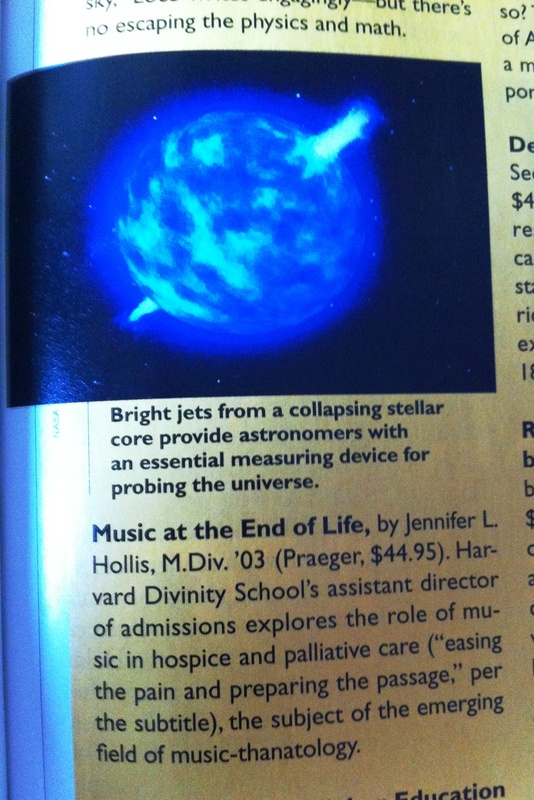 < Previous Music at the End of Life debuts on NPR! Great work! Virginia Woolf claims that everyone needs “a room of one’s own.” Agreed. Having a room of one’s own, however, does not guarantee greatness. Greatness is when the blood, sweat, and tears of one’s intellectual labor pains, which certainly occur in the sanctuary of that writing space, produce a healthy, beautiful newborn. Congrats! THIS IS WONDERFUL JENNIFER!! CONGRATULATIONS!! Can’t wait to work on you and get a copy of your book. I see good things for you as your work in our beautiful city becomes more well known. Healing Harp for ALL! !